In late 2007 308ar.com was born out of several thoughts and ideas. 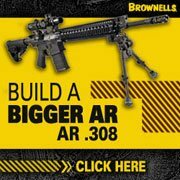 The first being that AR15 shooters would eventually seek a more powerful platform, hunters not interested in a 5.56 weapon might embrace the more powerful 7.62/.308 Winchester cartridge and long range precision target shooters would gravitate towards and appreciate the modularity of the 308AR platform. Lastly that while on the surface the Armalite AR-10, DPMS LR-308, and AR15 look similar there are substantial differences. The AR15 difference should be obvious as a 7.62 rifle, .308Winchester cartridge is longer longer than a .223/5.56 and simply cannot dimensionally fit in a mil-spec AR15. This leaves us with the subject of this post, the Armalite AR-10. 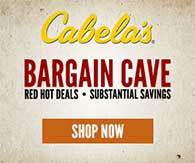 First off let’s start with the simplest reason all 308AR rifles are not an AR-10. The Armalite “AR-10” is a trademarked model of rifle from Armalite. To call all 308AR rifles AR-10 is like saying every cola is Coke, every muscle car is a Mustang or all plastic wrap is Saran Wrap. All three of those products are trademarked names of their respective brands and should not be used interchangeably. Now for the more complex reasons the Armalite AR-10 is the only AR-10. In 2015 the differences are now less then the were three years ago but they are no less confusing and no less insignificant. Armalite AR-10 Upper Receiver – the Armalite AR-10 upper receiver has a profile that prevents it from properly fitting on a DPMS LR-308 style profile. 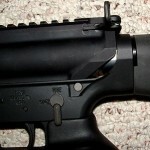 An Armalite AR-10 upper receiver should only be used with an Armalite AR-10 lower receiver. 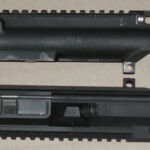 The Armalite AR-10 upper receiver uses a barrel extension and bolt unique to the Armalite AR-10 upper receiver. 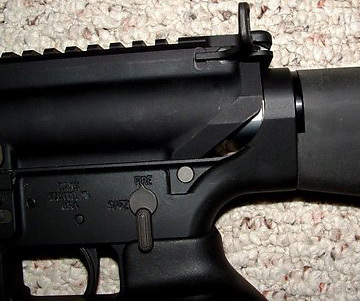 Do not use a DPMS LR-308 bolt in an Armalite AR-10 barrel/barrel extension. Likewise do not use the Armalite AR-10 bolt in a DPMS LR-308 barrel/barrel extension. 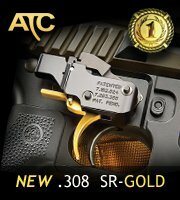 Armalite AR-10 Lower Receiver – the Armalite AR-10 Lower Receiver has a unique profile and should only be used with an Armalite AR-10 Upper Receiver. There are two Armalite AR-10 Lower Receiver styles prevalent today. The most common uses the proprietary Armalite AR-10 magazine once based on the M14 magazine which was developed and utilized as a result of the Clinton era Assault Weapon ban. These Armalite AR-10 Lower Receivers are not compatible with DPMS-LR 308 magazines, Magpul 308 AR magazines or Knights Armament SR25 magazines or their clones. Recently Armalite resurrected their preban Armalite AR-10 lower receiver which will accept the DPMS-LR 308 magazines, Magpul 308 AR magazines or Knights Armament SR25 magazines and their clones.